Mrs. Vera Marcelle West Wood, age 82 of Wilkesboro, passed away Tuesday, November 20, 2018 at Wake Forest Baptist Medical Center in Winston Salem, NC. Funeral services will be held 2:00 PM Saturday, November 24, 2018 at Reins Sturdivant Chapel with Rev. Michael Minton and Rev. Eddie Tharpe officiating. Burial will be in Scenic Memorial Gardens. The family will receive friends from 12:30 until 1:30 prior to the service at Reins Sturdivant Funeral Home. Mrs. Wood was born August 3, 1936 in Wilkes County to Walter and Lakie Mae Marley West. She was the previous owner of Moravian Falls Grill. She was preceded in death by her parents, a grandchild; Lisa Wood, four sisters; Estell Ayers, Mozell Marley, Blondel Minton and Nora Shoun and two brothers; Glenn West and Arnell West. 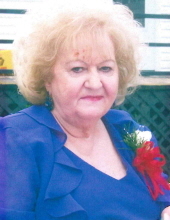 She is survived by two daughters; Dinah Grose and husband Mike of Ferguson and Deborah Meade and husband Billy of Moravian Falls, four grandchildren; Melissa Hartley Hamby of Wilkesboro, Justin Grose of Purlear, Shane Grose and wife Amanda of Millers Creek and Lee Grose and wife Mandy of Purlear, eight great grandchildren; Brian Hartley, Carlin Grose, Eli Grose, Easton Grose, Braxton Grose, Payton Grose, Taylor Williams and Stephanie Brown, four sisters; Verna Hicks and husband Buck of Elk Park, Novella Hamby of Lenoir, Carolyn Shell of Ferguson, Dare Goble and husband Jimmy of Lenoir and a brother; Melvin West and wife Verna of Ferguson. Flowers will be accepted or memorials may be made to Susan G. Komen PO Box 650309 Dallas TX 75265-030. To send flowers or a remembrance gift to the family of Vera Marcelle West Wood, please visit our Tribute Store. "Email Address" would like to share the life celebration of Vera Marcelle West Wood. Click on the "link" to go to share a favorite memory or leave a condolence message for the family.